Tsunami-linked fishing boat adrift off B.C. 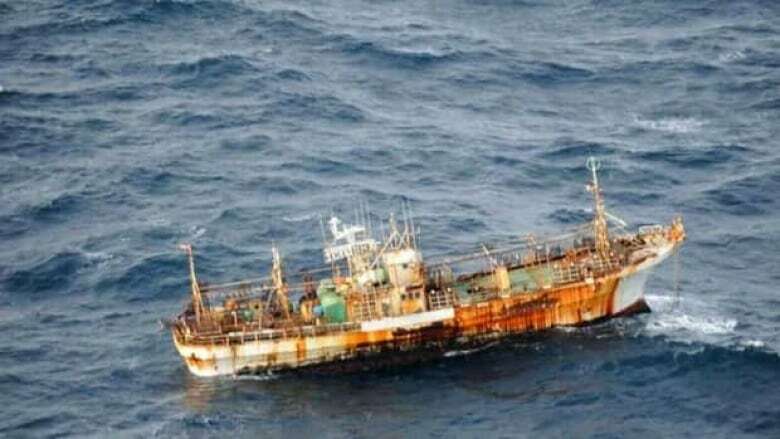 A Japanese fishing boat that was washed out to sea in the March 2011 Japanese tsunami has been located adrift off the coast of B.C., according to the federal Transport Ministry. "Close visual aerial inspection and hails to the ship indicate there is no one on board," Liu said. "The owner of the vessel has been contacted and made aware of its location." U.S. senator Maria Cantwell, of Washington, said in a release that the boat was expected to drift slowly southeast. "On its current trajectory and speed, the vessel wouldn't make landfall for approximately 50 days," Cantwell said. Cantwell did not specify where landfall was expected to be. The boat is the first large piece of debris found following the earthquake and tsunami that struck Japan one year ago. Scientists at the University of Hawaii say a field of about 18 million tonnes of debris is slowly being carried by ocean currents toward North America. The field is estimated to be about 3,200 kilometres long and 1,600 kilometres wide. Some people on the west coast of Vancouver Island believe smaller pieces of debris have already washed ashore there. The March 11, 2011, tsunami was generated after a magnitude 9.0 earthquake struck off the coast of northern Japan. The huge waves and swells of the tsunami moved inland and then retreated back into the Pacific Ocean, carrying with them the wreckage of buildings, cars and boats.